Peel and finely chop garlic and set aside. 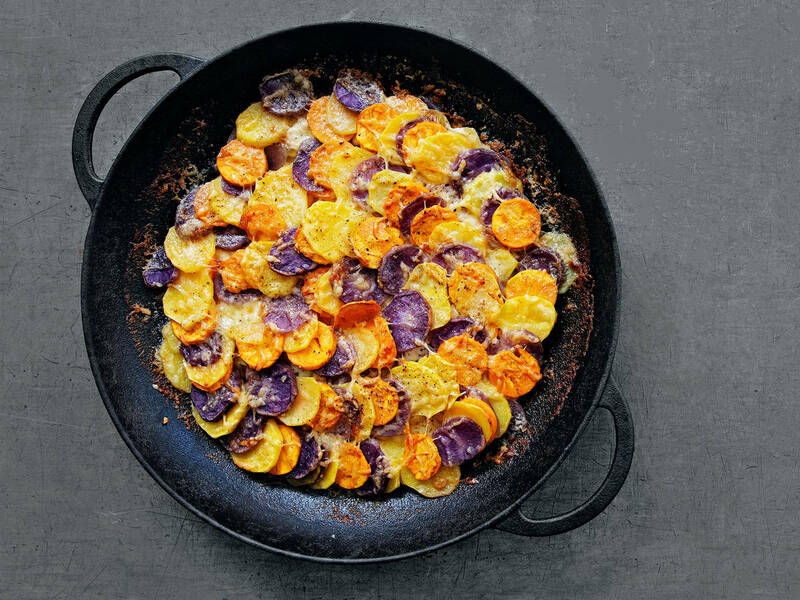 Peel and finely slice potatoes, purple potatoes, and sweet potatoes. Evenly layer half of the potatoes a microwave-safe baking dish. Season with salt and pepper. Sprinkle with three quarters of the shredded Emmentaler cheese. Then, layer the remaining potatoes, alternating yellow, purple, and sweet potatoes. Sprinkle remaining cheese on top. In a small bowl, mix finely chopped garlic with heavy cream and season to taste with salt, pepper, and ground nutmeg. Pour over potatoes and distribute butter in pieces on top. Transfer the baking dish to an oven with microwave function and bake the three potato gratin for 25 min. at 180°C/350°F, 360W. Enjoy!